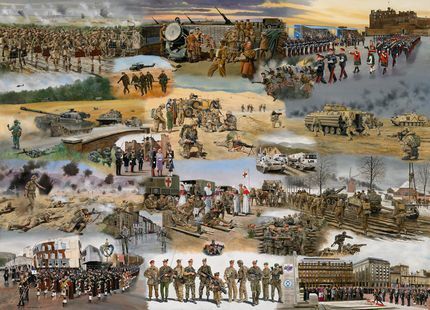 On the 7th October 2015 the Army presented this oil painting, entitled Service, by Military Artist David Rowlands, to the Scottish Parliament. 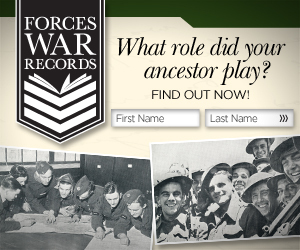 It celebrates 100 years of the Scottish people's contribution to the British Army. It shows the outbreak of the First World War and the painting was unveiled on the centenary of the Battle of Loos in which over 35,000 Scottish soldiers took part. 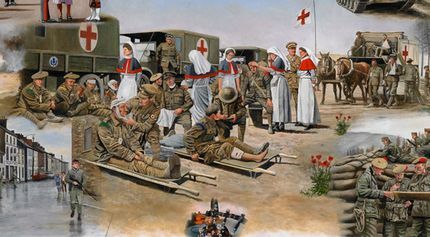 The Queen Alexandra's Imperial Military Nursing Service can be seen tending to the wounded in this central scene. Copies of the oil painting can be bought from the artist David Rowlands. More examples of David's RAMC and QARANC paintings can be seen on the Camp Bastion Field Hospital and Medical Treatment Facility page. See also the Oil Painting Matron QAIMNS Tropical Uniform page.